Koottu curry can be made either as a sweet dish or as a lightly spicy one. Below steps are for preparing the sweet one. =►Cut vegetables( Yam, ash gourd & carrot) into small cubes evenly. =► Boil chana dal with one cup of water. =► When the chana dal is almost cooked add yam, ash gourd and carrot along with 2cups of water. 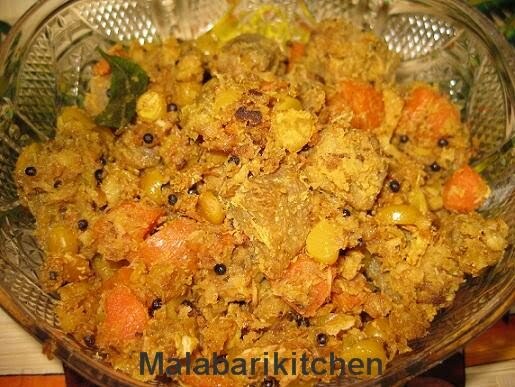 =► After the vegetables are cooked add 2-3cubes of jaggery, turmeric powder and chilly powder. =► Grind 3tsp of grated coconut with ¼ tsp of cumin seeds and pour it into above cooked vegetables ( make sure that the vegetables are dry). and 3-4tsp of grated coconut. =► Serve with plain rice.